Appearing noetically in the noble arena. 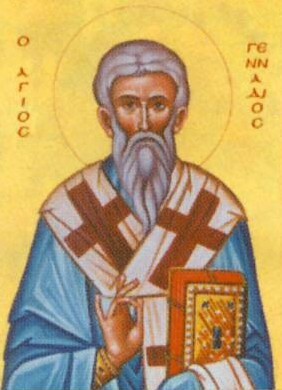 The divine Gennadios was first ordained a Presbyter in the Church of Constantinople, and in the year 458 succeeded Anatolios as Archbishop of Constantinople. From the beginning of his episcopate Gennadios proved his zeal for the Christian faith and the maintenance of discipline. For example, Patriarch Gennadios would not ordain anyone unless they knew the Psalter by heart. 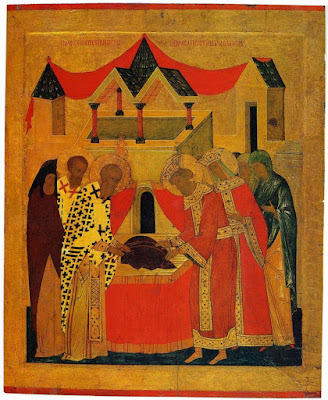 In the first year of his episcopate, on 2 June 458, Saint Gennadios received into Constantinople and transferred the sacred Robe of the Theotokos into the newly constructed Blachernae Church with appropriate solemnity, placing it within a new reliquary. Later, in 463, he helped established Stoudios Monastery, bringing about a thousand monks there from Akoimoitos Monastery. Gennadios' liberality and desire for order was observed in his appointment of Marcian, a Novatianist who had come over to the Orthodox Church, the steward of the goods of the Church of Constantinople. Under Marcian, it was ordered that each cleric could receive the offerings of their church to distribute through him, whereas previously the offerings were given to the Church of Constantinople for distribution. In 459 Gennadios summoned a synod in Constantinople of 82 bishops, in which simony was condemned. The encyclical he wrote on this matter, which is preserved till this day, was officially given ecumenical authority by the Sixth and Seventh Ecumenical Synods. Timothy Aelurus, the Monophysite who made himself the Patriarch of Alexandria and was later chased from the Patriarchate by order of the Roman emperor, had obtained leave to come to Constantinople, intending to re-establish himself on his throne. On June 17, 460, Pope Leo I warned Gennadios against Timothy Aelurus, and urged him to prevent the voyage of Timothy and to secure the immediate consecration of an Orthodox Patriarch for Alexandria. Timothy Aelurus was banished to the Chersonese, and Timothy Solofaciolus was chosen Archbishop of Alexandria in his stead. "I shall set down other things about him [Gennadios] full of amazement. A certain painter, while painting an icon of Christ our Master, found that his hand shriveled up. 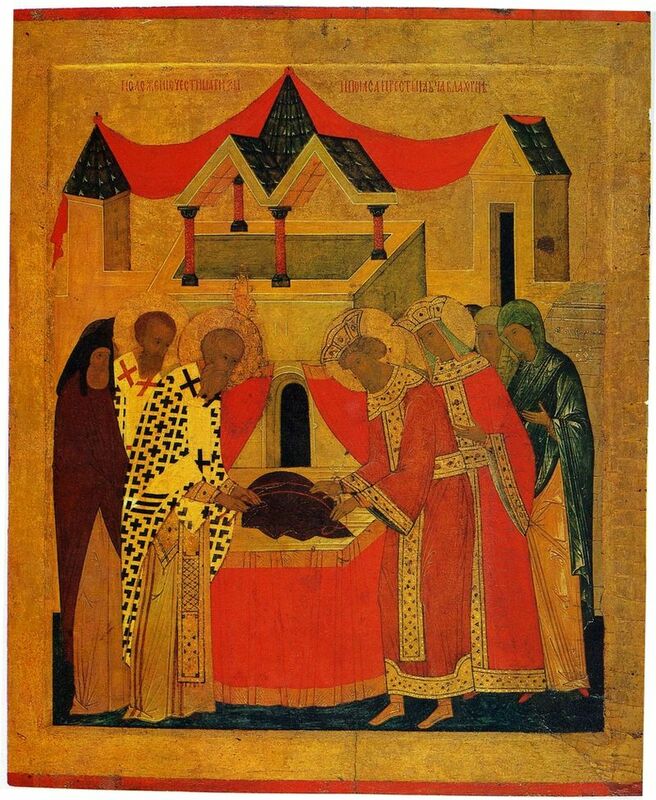 And it was said that, as the work of the icon had been ordered by a certain pagan, in the adornment of the name of the Savior he had depicted his hair divided on his forehead, so that his eyes were not covered — for in such a way the children of the pagans depict Zeus — so that those who saw it would think that they were assigning veneration to the Savior." "We went to the cenobium called Salama, nine miles distant from Alexandria, and met two old presbyters there who told us that they were presbyters of the Church of Constantinople. They told us about the blessed Gennadios, Patriarch of Constantinople who was of a most gentle nature, pure of body, very temperate. The apocrisarius went in to the oratory, stood before the altar, and stretched out his hands towards the martyr's tomb. Next day Charisius that worker of wickedness was indeed found to be dead, and all were astonished and glorified God." About the same time Saint Daniel the Stylite began to live on a pillar near Constantinople, apparently without the permission of the Patriarch or the owner of the property where the pillar stood, who strongly objected to this strange invasion of his land. The Emperor Leo protected the ascetic, and some time later sent Gennadios to ordain him priest, which he is said to have done standing at the foot of the column, because Saint Daniel objected to being ordained and refused to let the bishop mount the ladder. At the end of the rite, however, the patriarch ascended to give Holy Communion to the stylite and to receive it from him. Whether he then imposed his hands on him is not said. Possibly he considered it sufficient to extend them from below towards Daniel. Gennadios entered the Holy Altar one night to pray, and he suddenly beheld a demoniacal ghost, which, because he reprimanded it, cried out that as long as he was alive he would be quiet, but that after he died he would trouble the Church. Frightened on this account, the Saint begged God for comfort and to preserve the Church from harm, and he left his see due to health reasons in 471. 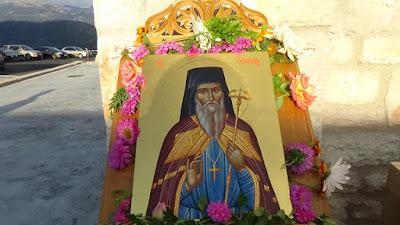 According to Neophytos the Recluse (1134-1214), who wrote an encomium to the Saint, shortly before his repose he went to the Holy Land and then to Cyprus as a simple monk, and when in Paphos he went to dwell in the hermitage of Saint Hilarion, but he reposed in the village of Moro Nero due to the cold weather. A church was later built over his tomb, the ruins of which can be seen today. Gennadios was the author of many works, though very little of his writings survive. He wrote many commentaries on Holy Scripture, especially the Epistles of Saint Paul, but we only have excerpts of what he wrote on Genesis, Exodus and the Epistle to the Romans. Before he became Patriarch, in 431 or 432, he had written a work against the Twelve Anathemas of Cyril of Alexandria, which brought enmity between them initially, but later they seemed to have reconciled. Many homilies and other doctrinal works were also attributed to him. Having been adorned with the forms of the virtues, you were shown to be a wise Archbishop of the Church, and true shepherd, Father Gennadios, as a healer of Christ, and communicant with the venerables, in all righteousness. And now you entreat without ceasing, that He may have mercy on our souls.